Anyone see this last week? They lit up the inside of the Great Bridgewater Tunnel (that the one by the GMEX?) with lights spelling out "Be Original" and "Be Modern" - from His Holiness Peter Saville's vision for rebranding Manchester. Apparently there are more light displays coming, in different parts of the city, over the next couple of months. 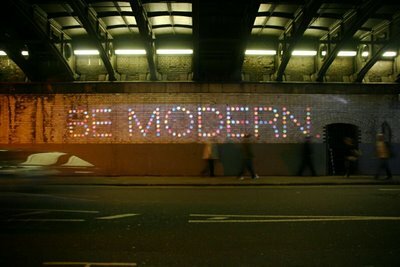 I saw it when the anti-Blair demo passed under that bridge but daylight made the words unclear. Those colour blind in the crowd demanded to know who 'Sod'em' were and I said apparently they're from Hartlepool in the North East and the next big thing, just about to break. Got an album out called Sod'em & Tommorah which wasn't very good. Sort of sub Artex Minkies but without the tunes. People nodded at the folly of art and we all moved on. It was that kind of day. Oh yeah and there was approximately 30-40,000 passed under that bridge and all really furious at Blair and his disgraceful government. Thought I'd better mention that. I'm all for public art, but that just looks a bit S Club 7, doesn't it? I like the blurry car to the left of your picture though.